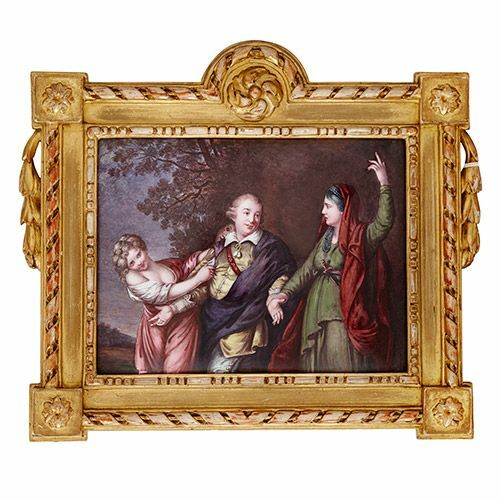 This plaque, which takes the theatre as its subject matter, exemplifies the supreme quality of enamel production from within the French town of Limoges. 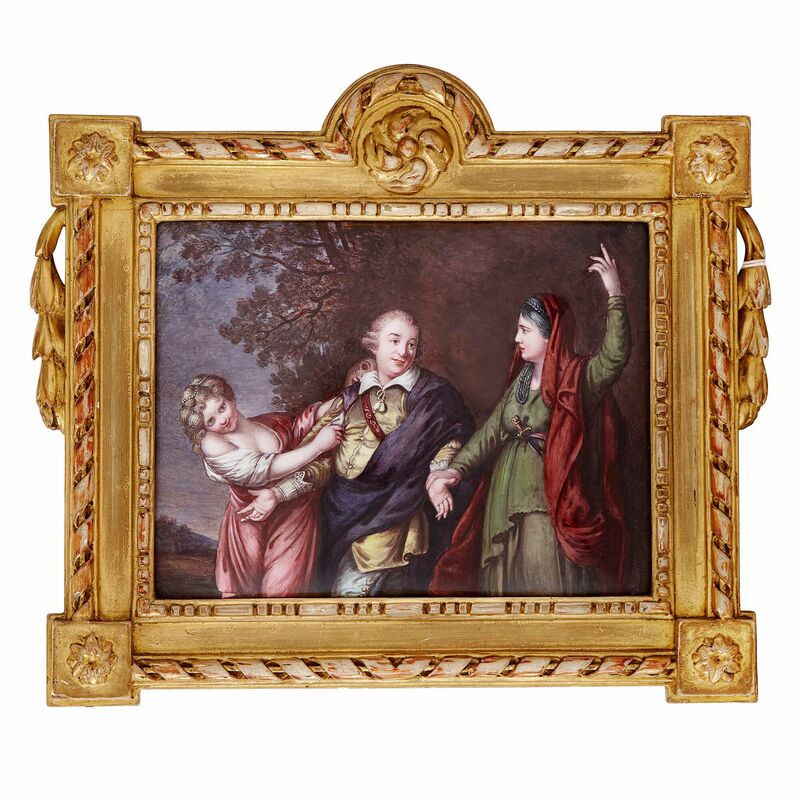 This beautifully-painted enamel plaque depicts a gentleman, dressed in 18th Century costume, standing between two women, each of whom clasps his body possessively. The main wears a faint smile on his face, and his two arms are outstretched, palms facing upwards, almost in a shrug. The woman standing on the gentleman's left clasps his wrist and raises her left arm, pointing to the sky. She has dark greying hair, and wears a long-sleeved dark green costume, with a dagger tucked into her belt, and a long red shawl draped over her head. She has a pained expression on her face. By contrast, the woman to the man's left tugs at his sleeve with one hand, and in the other she holds a mask. She smiles flirtatiously, and she wears a light white and pink dress that slips off her shoulder. Her hair is blonde, and she appears youthful and light-hearted. While the space behind the dagger-bearing woman is of dark woodland, the area behind the woman wearing the pink dress is full of sky and horizon. 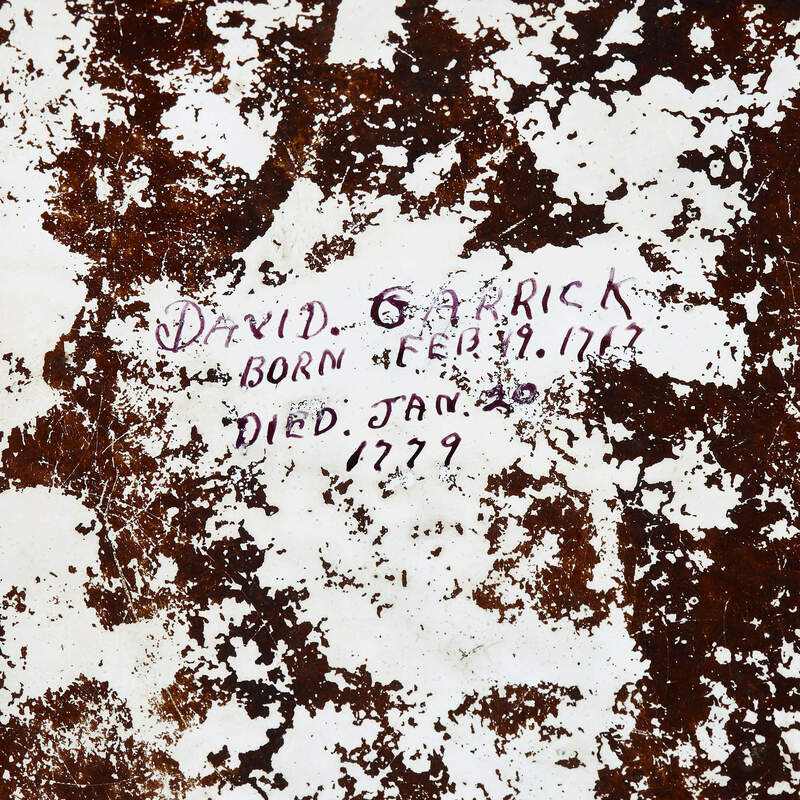 'David Garrick / born Feb 9.1717 / died Jan 20. 1779' is signed on the back of the plaque. 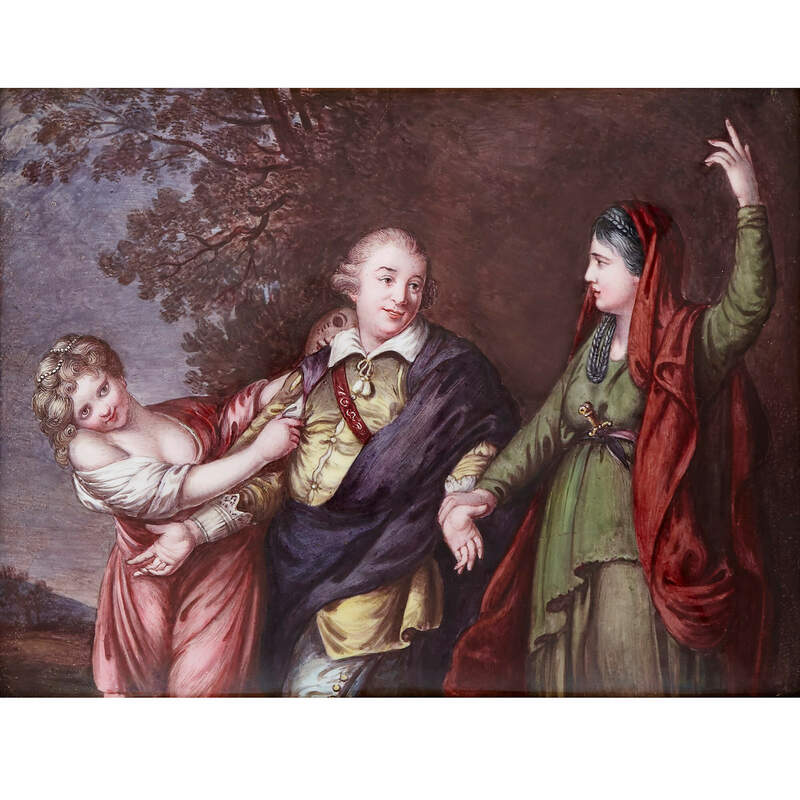 Garrick was a famous actor, playwright, theatre manager and producer in the 18th Century in England. 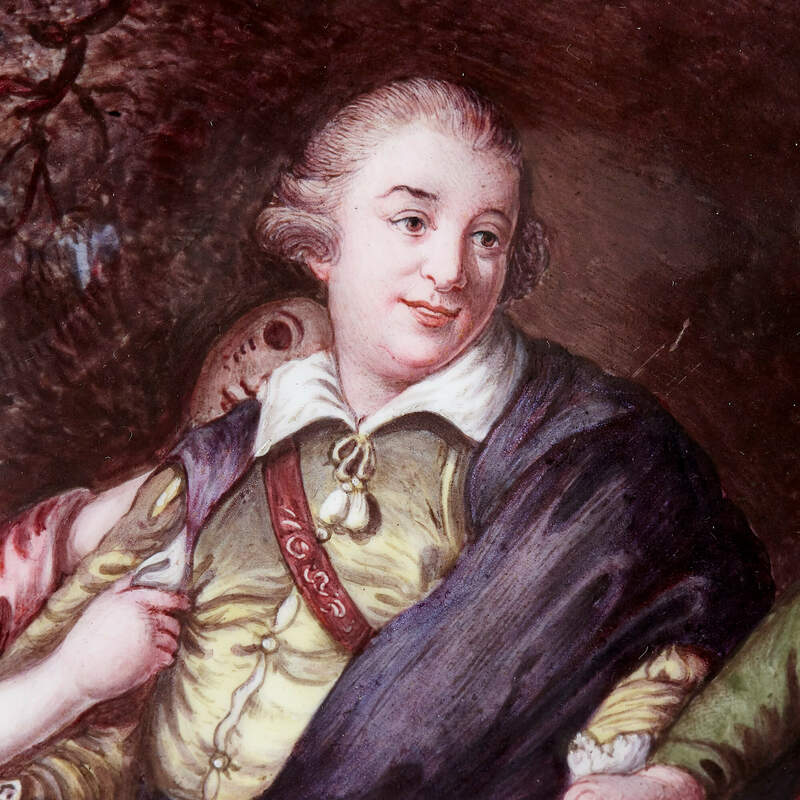 With knowledge of the inscription, it would seem David Garrick is the man depicted in the image. 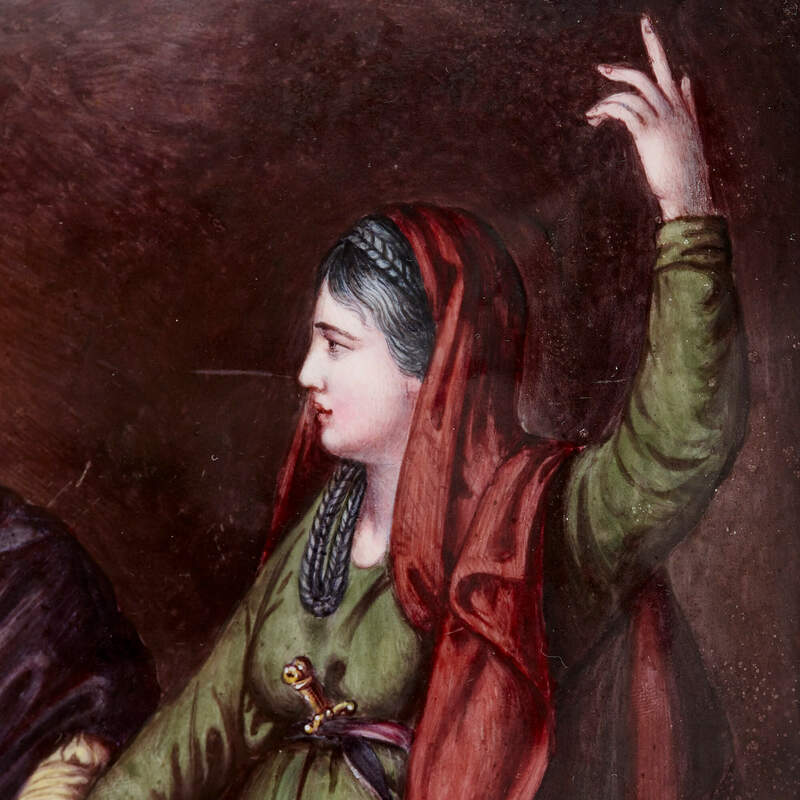 It is therefore possible that the two women seen beside him are the personified figures of Comedy and Tragedy. The plaque is set within an ornamental giltwood frame, which has been carved with rosettes and red-painted twisted rope and bead forms.